Says the head of Powergen at Bord na Mona, John Reilly: "We're not in the business of trying to destroy the landscape. We're not in the business of trying to make life more difficult for people, not at all." Come to think of it, the CEO of BP could have said the same thing after the Gulf of Mexico oilspill: "We're not in the business of trying to destroy marine life with our petroleum, not at all." But if he had said that, he would have been ridiculed by the media, with good reason. Ireland is short of money but not wind, which now forms a central plank of its energy policy. But plans to develop wind power and export it to Britain are sparking a rural revolt, with local protest groups uniting through social media. Some claim Ireland will become a wind farm for Britain. Turbines up to 180m (590ft) tall - half the height of the Empire State Building - are cropping up as part of a drive to meet EU green energy targets and generate 40% of Ireland's electricity from wind. Revenue, too, will flow by exporting power to Britain under inter-governmental plans. More than 100 opposition groups have sprung up against new wind farms - all in rural areas - claiming the turbines will ruin the landscape, with noise and shadows blighting homes nearby. Some have joined forces with groups opposing planned new electricity pylons to upgrade the national power grid. Wind energy companies say they follow strict Irish planning guidelines, now under review due to new larger turbines and local opposition. A country pub in County Laois is packed on a Monday night for a meeting of the Laois Energy Awareness Group. Ray Conroy helped set it up, he says, after energy companies suddenly appeared, doing deals with some locals for turbine sites. "The first we knew was when our local authorities and government announces 'wey hey - wind farms are coming, and it's a boom for everyone'. It's nonsense," he says. "Are we going to ruin our environment to save the UK's environment? There's nothing in it for the citizens of this island. The only winners are going to be multinational corporations who are sucking subsidies from the UK taxpayers. "They're ruining our landscape. There might be some tax revenue in it for our government but, overall, what price are we willing to pay?" Another speaker wins applause after his account of an anti-wind turbine protest at Vinegar Hill in Wexford - site of a key defeat in a rebellion in 1798 but etched in the folklore of Irish history through song as a place of resistance. The footprint of history is found too at the rolling estate of Stradbally Hall near the pub. Thomas Cosby's family has been here since the 16th Century, part of the Anglo-Irish gentry. Behind his stately home, the appearance of a giant mast heralds a wind turbine twice as high. "It is incredibly beautiful, the hills and the valleys that carry on the whole way across the county," he says. "For this industrial invasion to come in is going to be absolutely nuts." He accuses energy companies of operating a "divide-and-conquer attitude" through secret deals with some locals despite the opposition, citing offers of more than 20,000 euros (£16,500; $27,300) a year per turbine - big money in a country seeing hard economic times. "It's very much a divisive issue, you do see cousins and brothers now falling out over it," he says. "One fellow is looking at the turbine and getting nothing out of it - and the other is looking out at it and getting his 25,000 euros a year." 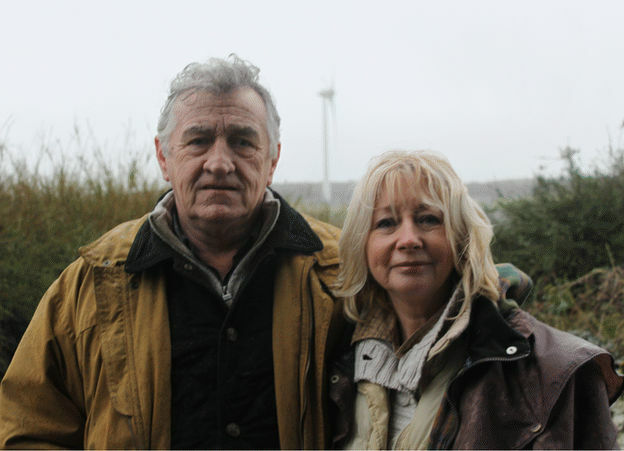 Dorothy and Michael Keane's retirement to remote County Roscommon turned to nightmare when wind turbines appeared on the hill nearby. Noise from the rotating blades caused sleep deprivation and serious illness for both. Under doctors' orders, they abandoned their house. "I remember coming into this room one day and I could hear this noise and it was driving me up the wall," says Dorothy Keane. "I remember thinking there wasn't a single solitary room in this house, in our home, where I could go and sit quietly and rest. The absolute silence of your own mind didn't apply here - it was just gone." Far from any houses, turbines sprout up on the Bog of Allen, where turf harvested for fuel has run out in parts of the vast peat plain blanketing central Ireland. The graveyard of one energy resource has become the cradle for another through the new wind farms, some for Ireland's power-sharing plans with Britain. Those in charge here recognise mixed public feelings - but insist they fully consult the community. 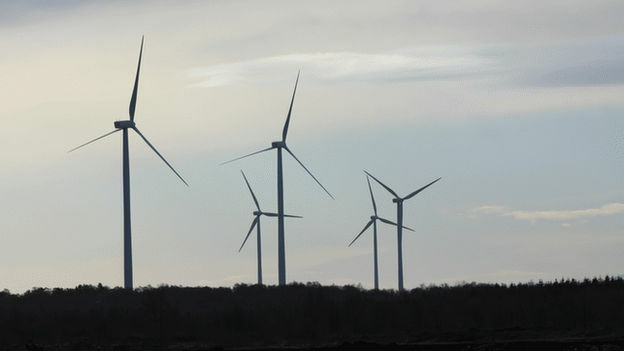 "We've said to people that we will only be involved in locating wind turbines where it is deemed appropriate to do so," says the head of Powergen at Bord na Mona, John Reilly. "We're not in the business of trying to destroy the landscape. We're not in the business of trying to make life more difficult for people, not at all." Exporting energy helps boost Ireland's economy but is not the driving force for him. "Our perspective as an energy company is about looking at the way we generate electricity today and the way we need to generate electricity into the future," he says. "We're focusing on trying to contribute to the decarbonisation of our economy and the decarbonisation of the European economy as a whole." The fact there was little public protest over the harsh austerity measures that followed the economic crash in Ireland earned IMF and EU praise for the Irish people. By contrast, the row over wind farms appears to be energising parts of rural Ireland in a campaign which may have taken the country's leadership by surprise in blowing its way to the centre of Ireland's political agenda.